At the end of December each year, I create my End of Year posts, and the year of 2015 will be no different. There will, however, be one change; this years Top 11 Idols post will be chosen not by myself, but by YOU, the readers and Idol Lovers. I have opened this vote up and made it so that you can add Idols, or pick and choose from existing answers. This is so that you can vote for whoever you want, whether they may sing J-pop, K-pop, C-pop, whether they are male or female artists, indies or major - it is up to YOU, because this is all about who you have loved over the past year, so if you adored them, then vote and make sure their name is seen on the list! Age limit also doesn't matter, so if your Idol happens to be a certain age... well, who cares, right? You Idolise them, so yeah, add them! The Idol doesn't even have to be current, so long as they are someway, somehow, still on the scene, whether it's by blogging or Instagram or however else they keep in touch with the Industry. So long as they have some form of presence, they can be on there! With this list, too, you can provide some people with an idea of who is on the scene, and who they could possibly follow. Giving insight into other singers and groups is a great thing, so definitely go for it! And if you change your mind...? Well, you can always change your answer! It's easy peasy! Once everyone has voted, I will look at the results and post the Top 11 (possibly some honorable mentions!) in a Year End post before January 1st 2016, so if you want to get your vote in, be sure to do so by then to give your girl a chance at winning! So, yeah... go on and do it! This is purely for fun, but I truly would love to know who everyone's Top Idol is for the Year 2k15, so I do hope that you all participate and cast your votes for the Idol you think should be the at the Top of the Year. There is nothing I can give you for this, other than the satisfaction that you voted for someone, and that you are potentially letting others know about an Idol, and the group they are from, too. 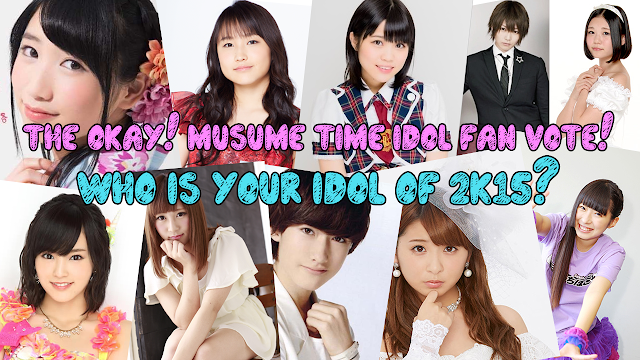 Share the love, and certainly share your Idol of 2015! Vote HERE for your Idol of 2015! Until next time, please stay happy, healthy and lovin' those Idols!